In our February 19, 2010 newsletter and on our website, we've solicited your stories on how cuts to public education funding are affecting you. Here you'll find some of the responses we've received. These cuts are real and they are impacting classrooms around our state--in K-12 public schools and our community colleges and universities. Now is the time to have an open and frank conversation about the consequences of being at the bottom for public education spending. Your voice matters. We encourage you to share your experiences. 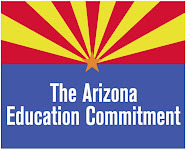 Send your story, photos, or videos to info@arizonaeducationnetwork.com. School cuts have hurt our elementary school. First, we lost our computer tech person. Recently, the computers were infected by a virus. Over a dozen computers cannot be used due the virus, and our computer lab has been shut down while we wait for help to be sent out to our school. Second, a former teacher recently passed away. We don't have a school counselor any more. A counselor from another school came to our school for one day. Many of the children are still upset, but we don't have a counselor on-site; so if the kids want to talk to a counselor about their grief/feelings, there is no counselor on-site. Thank you for the opportunity to describe how the Arizona education cuts are affecting our children. My son is in 4th grade in the Paradise Valley School District. At the end of the 2008-2009 school year, there were three 4th grade classes for the 2009-2010 school year, but one week before school started, it was decided that there were not enough children to warrant three classes. There are now two classes with thirty-five students each. This has been a huge concern for many of the parents, but no real solutions have been provided by the school's administration. The teachers are doing the best that they can, but it is difficult to spend quality time with any of the students. I attended the latest PTSO meeting at our school and at this point, the same situation will be occurring in the 2010-2011 school year. Why is this acceptable? Why does the State of Arizona think so poorly of our children that we are number forty-nine in student spending? These children are the doctors, police officers and teachers of the future. When is someone going to get that? Thank you for thinking of our kids. They deserve better. I am a third grade teacher in the Flowing Wells School District. Although the district as a whole does its best to maintain reasonable class sizes, the tax cuts of last year hit us hard. At our school we lost 4 certified positions this year, which resulted in higher class sizes. Last year, my third grade class had 19 students. This year, my class has 31 STUDENTS. That's a 63% increase. My classroom is packed with desks--it's hard to find a way to seat the students effectively and comfortably. If I get even one more student this year, I will have no textbooks for him/her. Supplies are--well, in short supply. If it were not for the generosity of parents and other donors like the Tucson Jewish Federation, I would have run out of paper and other necessary supplies long ago. And, although I did not get into teaching for the money, it is worth mentioning that I am making $2000 less this year than last because of the decrease in 301 monies. I am also working much more. 63% more students means 63% more papers to grade, and more time spent inputting grades into the computer, conferencing with parents, and planning and preparing for lessons. I am working 10 hour days and then going home and grading papers. I am exhausted and frustrated, and worried about the kids. I know it is going to get worse, and our kids deserve better. We're seeing larger class sizes and in our middle school this equates to less support staff, less supervision, more difficulties in the classroom, which impacts their learning. The kids of middle school age are in great need of help I'm finding. They are at a time where testing their limits and and trying to figure out their own selves. The larger class sizes induces more interruptions, less help for kids who need it, and when teachers need to step out of the room for a minute- no supervision and kids act out and sometimes do obscene things with out the teachers in there. Therefore the focus becomes dicipline rather than learning. I'm exasperated by the things we hear from our kids and other parents who's children share their experiences. I want our kids to be in a safe learning environment!!!! !